You can import E-Mails from various sources. Only the Excel format requires you to have Excel installed. If you have any unknown format, use “Other file” and the program tries to find E-Mails in that file. 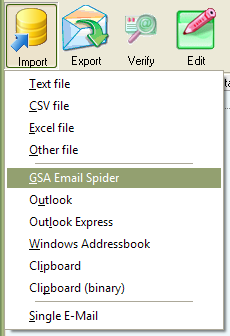 The Export Dialog has various options for you to save the proceed E-Mails. There are basically two ways how to save it. This will try to save in a way it was imported. If you e.g. 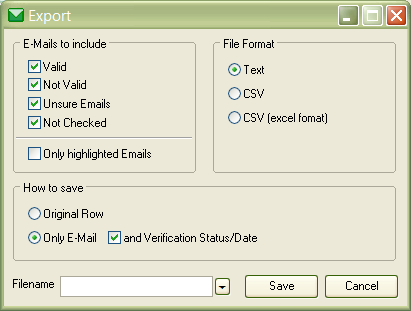 imported a CSV or Excel file with much more columns in it that the E-Mail, you can use this option to export only the rows of it with valid E-Mails. You will than have all extra data that comes with the E-Mail again in the export file. This will create a new file saving just the E-Mail in one row and maybe the verification status and date if you checked that option. There are three ways on how to verify E-Mails. No SMTP-Server is contacted when doing this test. It can only tell you if that E-Mail could exists but it does not tell you if the mail account is still existing on the provider. This will do all of the above and will try to connect to the SMTP-Server to send an E-Mail to it. However, no E-Mail will ever be delivered as sending is aborted before the final sending is happening, even with full simulate option. This will do a Full Test as well but let's you define the time and date when this should happen (e.g. at night when noone is in office). This let's you remove or select E-Mails to your needs. You have various tools to choose from. Shows the summary of the verification process with statistics of Verified, Unverified and Unsure replies. Some replies from SMTP-Servers are cached in case they do not allow a verification. In that szenario it would make no sense to contact them again and again. But if you change some importen things on your settings like the proxy, it might allow you to access that SMTP-Server again. In that case it makes sense to clear the cache and try to verify again. The E-Mails in the list get shuffled and randomized. 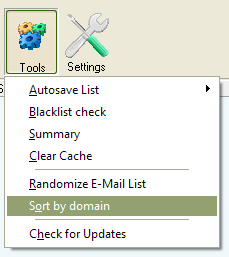 The E-Mails in the list are sorted by there domain (user@domain.com). Does a quick check if there are updates for the program available. This happens also when you startup the program. Click this button to open the settings dialog.